Digitizing Kerala’s Past is an inter disciplinary initiative by the Kerala Council for Historical Research that aims to survey, store and study the historical, cultural and intellectual legacies of the people of Kerala. The project envisions the collection of various sources related to archaeology, anthropology and history into a digital repository of texts, images, monuments, artifacts, oral traditions, myths, experiences and memories that have been lying scattered within and outside the State. ‘Digitizing Kerala’s Past’ makes use of the vast scope of virtual space to document historical legacies onto a common platform with active public participation. 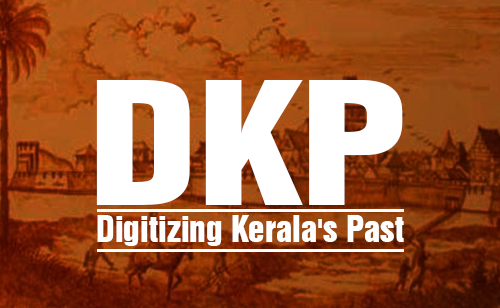 We have created an exclusive portal www.dkp.kchr.ac.in with a dedicated server for the project ‘Digitizing Kerala’s Past’. Rare documents and pre-1960s photographs associated with Kerala’s social, cultural, historical and scientific heritage will be electronically archived and uploaded in the DKP web portal. It will be accessible to the public. Digitization as a cost effective means of storing historical data. Adoption of user friendly means of digitization. Enable the general public to engage in the 'thinking' project. Help to spend quality time regarding our cultural roots. In the first phase, the following tasks are undertaken. 1. As part of Digitizing Kerala’s Past, the diaries and correspondence of Mrs. Eliamma Matthen, wife of Mr. C.P. Matthen who was a pioneer banker in the princely state of Travancore. The ten volumes of diaries covering a period from 2nd May, 1938 to 12th April, 1942, provide information on the socio-political life in the late 30s and 40s in Travancore. The material donated to the KCHR library by her family has been digitized and has been made available for reference. 2. In an effort to document everyday life, KCHR has introduced ‘A Day in the Life of a Malayalee’ which profiles the everyday life of a Keralite/Malayalee, including his or her lived experiences on a typical day, actual routines, thoughts and aspirations. The segment would include two types of reports – First Person Accounts of personal experiences on a particular day, and Reports of another person’s lived experience of a day, prepared in consultation with him and uploaded with explicit approval. Inclusiveness is the key here with ever-growing categories from all walks of Malayalee life, from parents to grandparents, police personnel to pilots, tribal heads to religious figures, party-workers to ministers, vendors to domestic help to IT Professionals and so on. 3. KCHR also collects reports of private and public events and experiences at the micro level. Under the ‘I have an event/experience to report’, the accounts would be drawn from the immediate vicinity of the reporter and would be first-hand information records. The themes covered extend to occurrences that often go unrecorded such as natural deaths, births, marriages, ceremonies, crimes, corruption, suicides, calamities, hobbies, care of the aged etc. This is an attempt to document contemporary history for the benefit of a person who might read it centuries later. Reports may be uploaded in English or Malayalam. 4. Another sub-project is the digitization of historical records, images and documents in personal/family/institutional custody via a village-to-village campaign using mobile digitization units in select Panchayaths. This people’s archive campaign would culminate in the Kerala Digital Archives of Documents and Images. KCHR is also gathering information from the public to locate different source materials available with individuals and institutions. In the second phase, pre 1960 photographs and images related to the social and cultural life of Kerala will be digitized and documented in the website. We also plan to share the audio and video files of historical significance. KCHR will maintain reference facility to provide public access to these documents and images under the regulatory protocols of public institution. We invite your whole-hearted participation in our mission to create the online repository of historical evidences. For more details Visit: www.dkp.kchr.ac.in. You are also welcome to be a promoter of this project through offering donation for which 80G Income tax exemption is available.